The Democratic Republic of the Congo declared an Ebola outbreak after two suspected cases tested positive for the Zaire strain of the virus, the World Health Organization reported Tuesday. The outbreak emerged in Bikoro, a town in the northwest area of the country, after local health officials reported 21 patients with symptoms of a suspected viral hemorrhagic fever — rare and life-threatening fevers caused by several families of viruses, according to the Centers for Disease Control and Prevention. Seventeen of the patients later died, according to the WHO. The virus is passed through direct human contact and originates in infected animals. It can be fatal in humans, with an average case fatality rate of around 50 percent. In past outbreaks, the case fatality rate has varied from 25 to 90 percent, according to the WHO. The Democratic Republic of Congo has dealt with several outbreaks since the virus was identified in 1976. Its most aggressive outbreak occurred from 2014 to 2016, with the majority of cases in Guinea, Liberia and Sierra Leone. A reported 28,616 cases were detected and led to an estimated 11,310 deaths, the CDC confirmed. The outbreak, which ended in 2016, also caused an estimated 36 cases in Italy, Mali, Nigeria, Senegal, Spain, the United Kingdom, and the United States. There is no real vaccine or treatment for Ebola, according to the CDC. When the virus is detected early, balancing electrolytes and intravenous fluids as well as treating any emerging infections can improve a patient’s chance of survival, according to the CDC. Clinical tests on an experimental vaccine, ZMapp, developed by Mapp Biopharmaceutical, were conducted in 2016. Though the vaccine was found to be “safe and well-tolerated,” according to the National Institutes of Health, data could not prove that it was more effective than treating the symptoms of Ebola. 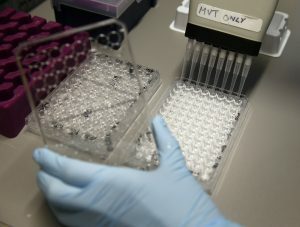 The WHO said in a statement it would deploy experts to support the Democratic Republic of Congo and attempt to prevent the virus from spreading.